Etruscan art included sculpture, pottery, metal work and painting. Whilst the Greeks influenced techniques and style, much of the impetuous was uniquely Etruscan. Etruscan art was an integral part of the development of Etruscan society. From the 8th century until the second century BC, it passes through four main phases: the Orientalising era, the Archaic era, the Classical era and finally the Hellenistic era. As the names of the eras suggest, Greek culture heavily influenced Etruscan art. Yet Etruscan art also contains many unique features of its own, in terms of style and content. Few examples of Etruscan bronze ware survive, probably because much of it was melted down for coinage as the various Etruscan cities were conquered by the Romans. But surviving pieces show the Greek infleunce on early pieces. Bronze figures of warriors and helmets from the sixth century BC look distinctly archaic Greek in style. This altered with time. Later examples of Etruscan bronzes, especially statues and facial portraits such as the first century BC statue ‘The Orator’, demonstrated a less archaic more individual look. The Etruscans also began to use bronze as a medium for creating incised scenes from their own mythology. Such was the Etruscan’s skill in working with bronze, that they were held in high regard by their original mentors, with the playwright Athanaeus praising the quality of Etruscan bronze work in his ‘Symposium’. Even into the Roman period, Etruscan cities such as Clusium and Arretium continued to manufacture high quality bronzes. Etruscan pottery closely modelled itself on Greek black and red figure ware and Greek style craters and drinking vessels. But once again, a uniquley etruscan style began to emerge: Black Bucchero pottery, a black styled pot incised rather than painted. The Etruscan created pottery that indirectly tells us much about their society. Most of these examples come from funerary remains. Terracotta hut urns used for cremated remains were styled to resemble typical Etruscan dwellings of round wattle and daub huts. Terracotta was also used in decorative panels, not only in tombs but in houses, as a recently excavated Etruscan villa in Murlo demonstrates. Large painted terracotta panels were used to decorate the building entrances, set with figures in relief. Hollow, kiln fired terracotta figures were also used to decorate Etruscan temple roofs. Arranged on the tiles at the roof edge and down the ridge, the bases of these statues were shaped to fit their exact position on the roof. The figurines were painted and became a distinct feature of Etruscan temple decoration. Most surviving examples of Etruscan sculpture are of funerary art such as sarcophagi made of clay or terracotta. As with early Etruscan bronzes, they begin stylistically resembling archaic Greek figures before developing a more assured and natural style, acting as portraits of individuals rather than Greek copies. Even when they copied Greek style, Etruscan sculpture retained a uniquely Etruscan element. The Sarcophagus of the Spouses, a sixth century BC archaic style terracotta tomb depicts a married couple reclining together on a dining couch. This sarcophagus informs on the differences in the public and private roles of the sexes in Etruscan and Greek society. Greek men and women dined separately. Clearly, the case was different in ancient Etruria. 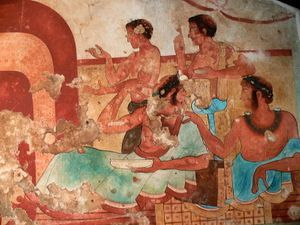 Most Etruscan frescos survive in tomb art. Paintings are two dimensional, use an array of bright colours and show animated action. Whilst they often show Greek stylistic influence, they also retain a uniquely Etruscan flavour. Some tombs show signs of Greek influences on Etruscan life. Frescos are shown to depict Greek style wrestling and elements of Greek mythology. Yet when Greek figures appear, they are portrayed in a uniquely Etruscan way. The fourth century BC Tomb of Orcus in the town of Tarquinia includes underworld scenes featuring a figure based on the Greek Charon. Whilst the Greek Charon is a ferryman, the Etruscan version is altogether more frightening. Carrying a hammer rather than an oar, he is accompanied by monsters and his flesh is the colour of a decomposing corpse. The Greek figure has been portrayed according to the Etruscan view of the underworld. Many religious elements are completely uniquely Etruscan. The Tomb of the Augers shows a man with a curved staff, interpreted as an auger, a non greek religious figure. Many other frescos feature funeral feasts and death rites that are not Greek in style, such as scenes interpreted as gladiatorial contests in portraits of Etruscan funeral games. Etruscan tombs also give a general overview of Etruscan life. Frescos also show scenes from daily life:fishermen about their work, banquet scenes and dancing, with birds and animals intermingling with human figures showing the importance of nature in day to day life. As with pottery and statues, many funeral scenes again show both sexes dining together. Gates, C (2003). Ancient Cities: The Archaeology of Urban Life in the Ancient Near East and Egypt, Greece and Rome . Routledge: London and New York.